Hey, everyone! My name is Katie and I’m the blogger behind A Worker at Home. I’ve been a follower and fan of Samantha for a few years now and I’m so excited to be here today! I’m a wife to my best friend and mama to 2 and soon to be 3 babes living our adventure-filled life on the East coast temporarily before we head home to California. I’m a former Spanish teacher and am now a Certified Personal Trainer and your typical coffee-loving and Target-shopping blogger. If any of you have read my blog in the past few months or seen life lately on Instagram, you know that I’m a little over halfway through this pregnancy and while I’m a bit nervous to have 3 kids under the age of 4 (send more coffee, please! ), I am so excited and so thankful to be growing our baby girl right now! When I got the chance to submit a post idea for today’s Saturday takeover, I thought that since baby is on my mind all the time lately that I could share some things that I’ve learned over these past few years that help me feel like myself even with life changing so often and so quickly! 1. Drink water. A ton of it. Sure, you and the nearest bathroom will hang out more than normal, but your skin and energy level will thank you. 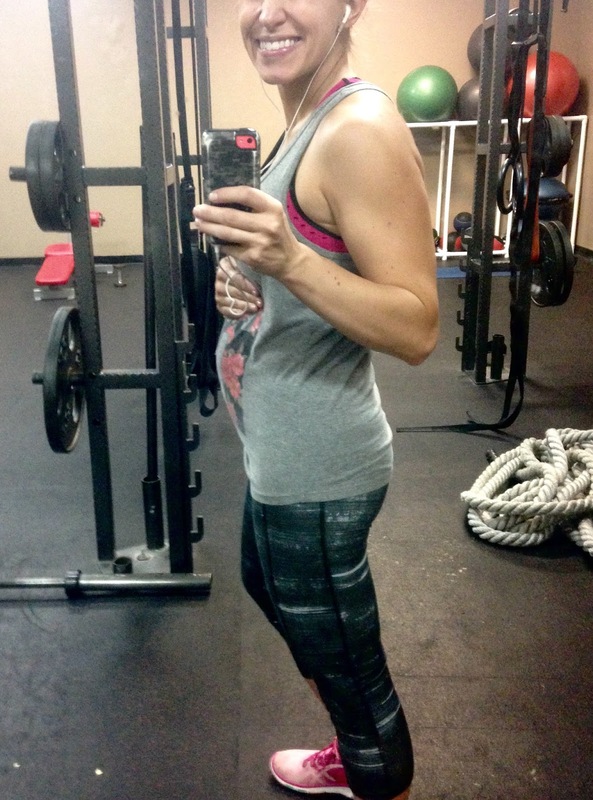 Take this from the girl who has had skin trouble ever since I can remember (and now has pregnancy hormones to deal with)– drinking water is a game changer. 2. Find non-maternity pieces that can work during and after pregnancy. I couldn’t guest post for the gorgeous and fashionable Samantha without talking about clothes right!? I’m a firm believer that pregnancy does not have to equal spending hundreds or thousands of dollars on maternity clothes (because, lets be honest- maternity clothes tend to be a whole lot pricier than “regular” clothes). Thanks to current trends, there are a lot of non-maternity options out there that will cover your growing bump (or shrinking, once baby is here!) while making you feel put together and beautiful. Flowy tops are incredibly forgiving during and after pregnancy (especially if you buy one size up from what you normally wear) and are easily paired with a pretty necklace or scarf. Low-rise or fold over pants/leggings, t-shirt dresses, and layering tank tops with sweaters when the weather cools down are some of my favorite things to dress in too. The best part is, I can wear all of these clothes after baby arrives as my body is figuring out life postpartum, and I won’t feel frumpy wearing maternity clothes (or while wearing a maternity shirt with the ruching on the side get questions about when the baby is due when I’m holding my newborn in my arms. Yeah that has happened). My favorite places to shop lately for these types of pieces are H&M, Target, Gap, and Nordstrom. GroopDealz and Jane.com have great and affordable options too depending on the week! 3. Make time to take care of yourself. Schedule an appointment to get your hair or nails done. If you’re anything like me, just an hour or two in a big comfy chair to yourself is enough to make me feel like I’m on vacation! Go on a walk with a friend to catch up (fresh air and exercise does wonders for your mood! ), take a new class at the gym, save up some money to buy that new watch you’ve been eyeing or a statement necklace or earrings that would complete your favorite date night outfit, or soak in a bubble bath with your favorite drink. Everyone has their “thing” that helps them to relax, recharge, and feel like themselves again and especially as a Mom, it’s so important to make the time to do just that. For me, sometimes just getting to the gym or getting outside is all I need to feel like myself. When it comes down to it, feeling beautiful doesn’t have to cost a lot of money, or take a lot of time. In fact, it’s as easy as deciding you are going to make the effort to make it a priority. 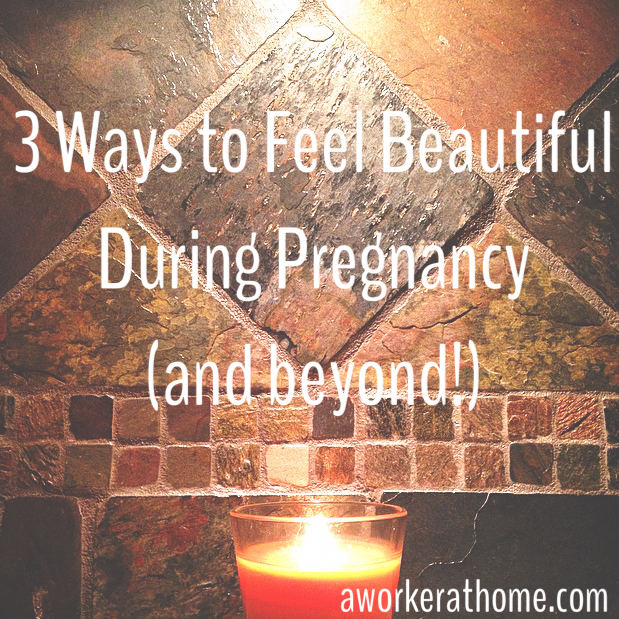 How do you feel beautiful (pregnant or not)? Thank you for stopping by and reading and thank you again to Samantha for letting me take over your awesome blog today! Come visit me at www.aworkerathome.com! I would love to meet you!